The thirty-eight miles from Santa Cruz to Monterey can be a very busy road to navigate. Route One is a major corridor with trucks carrying produce from the fields, and cars transporting farm workers, fishermen, tourists, recreation seekers of every stripe, and people like me who live and work at least part of their lives in this region. Hurtling through space, my eye catches glimpses of life’s daily epic poem acted-out by the inhabitants – people, plants and animals – of this region. Our Elkhorn Slough epic begins near Moss Landing, now a man-made harbor, but once an estuary, part of the Pajaro-Salinas river system that historically shared a common entrance to the Pacific Ocean. Launching kayaks recently on a cold gray Sunday morning, we were treated to a new chapter in this epic story. An important component of the Pacific Flyway for migratory birds, the harbor and slough are populated with many species. This day we spotted Bandt’s, Double-crested, and Pelagic Cormorants; Brown and White Pelicans; Common Loons; Clark’s, Western and Horned Grebes; Forester’s Terns, and shorebirds including Curlews, Dowitchers and Godwits. Elkhorn is also home to many marine mammals. Hauled out on the beaches and mud banks, harbor seals and pups nap after a busy night seeking nourishment in the waters of the Pacific. Sea Lions rest comfortably piled-up on man-made docks. 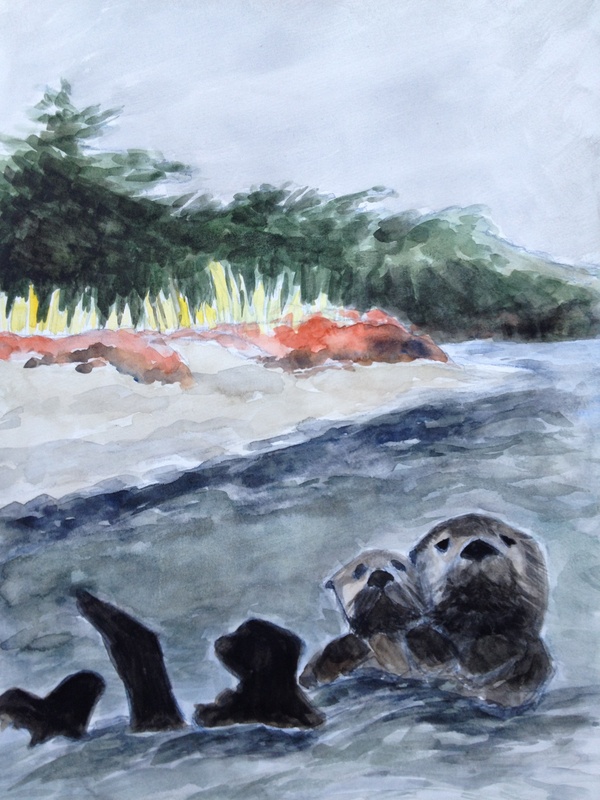 At low-tide, we spot Sea Anenome’s anchored to pilings and there secure amongst the now visible Eel Grass and occasional wayward kelp strand, we find mother Otters and their pups. The epic story of one such Otter pup is told in the movie Otter 501, a visual poem to stewardship. Paradoxically, Elkhorn Slough – a safety net to many animals and plants – is situated amongst a complex and encroaching human ecosystem including a vibrant agricultural economy, a regional power plant, an active fisherman’s harbor, recreational area for birders, hikers and kayakers, and a major north-south highway transporting people and goods. It is through tireless stewardship that these animals and plants survive in this amazing place. To the uninitiated speeding by in their cars, Elkhorn Slough is just a flash of light reflecting off water, punctuated mostly by the two power-plant towers dominating the skyline. But for the animals and plants it is a sanctuary part of the Monterey Bay National Marine Sanctuary (MBNMS). In 1992, MBNMS became a Federally protected marine area offshore California’s Central Coast. Stretching from Marin County to Cambria near Hearst’s Castle San Simeon, the sanctuary encompasses some 276 miles of shoreline and over 6,000 square miles of ocean. MBNMS is the home to one of the most diverse ecosystems in the world with more than 33 species of marine mammals, 94 species of birds and 345 species of fish. MBNMS partners with organizations and institutions such as the Elkhorn Slough Foundation, the Monterey Bay Aquarium and research universities including the University of California and Stanford to preserve, perform research, and educate citizens about co-existing as members of this ecosystem on the central coast. Elkhorn Slough is a fragile marine ecosystem. Most of us quickly drive by the Slough, preoccupied with getting to our next destination. Most of us don’t grasp the Slough’s role as a sanctuary in an epic poem, and fewer grasp that we are actors in the story and that have responsibilities to co-exist with the animals and plants as members of this ecosystem. We can actively choose to act as stewards; we can choose to oversee and protect places like Elkhorn Slough, places worth caring for and preserving because they provide sanctuary to living creatures that enrich our lives and ensure our survival both spiritually and physically. Anyone can be a steward; it can be as simple as recycling plastic bottles and composting vegetable waste or casting a vote to raise tax revenue to keep California State Parks open and education affordable for students at the University of California. Stewardship is becoming a member of the Elkhorn Slough Foundation to help create conservation easements or becoming a volunteer naturalist with the MBNMS or taking a child to the Monterey Bay Aquarium to teach them about the wonders of the ocean.